Let me take you back in time, to 2000. The pavilion had been crushed, skater Mecca (Venice Pavilion) razed! Our tribe gathered to make council and VSA rallied in front of the dozed rubble of hundreds of millions or steel, clay and urethane dreams. A demonstration for a skatepark took place; we rallied, petitioned, spoke and endeavored to build the dream. OH! Detractor and posers you will never fathom the personal toll to the many good folks who lent a hand in the struggle. To my skater brothers and sisters who are not on this earth to enjoy concrete nirvana, VSA salutes you! R.i.P Polar Bear, Paul Cullen , Big Fern, Dillon, Whitey, Mike Smith, Thumper,Pat Sleeper. Check this out.The issue with the sk8park is not homelessness. It would be fantastic to train and employ the disenfranchised in some capacity as to ensure integrity of the sk8park. However it is simplistic to think that to “give a homeless person a flashlight” will help anything at the skatepark or is realistic. Unfortunately the people trashing the park don't skate or care about the sk8park. These people are defecating, smoking dope, fornicating and or using the facility for the wrong purpose. These same people who are trashing the sk8park , did not lend a hand when VSA and L.A City arrived @ 6:00am to clean up their mess. Lets call a spade a spade and not B.S each other. Erroneous information and heresy will be sussed out and exposed as fraud. After all, I missed you at the California Coastal Commission hearing in 2001. Oh you didn't hear about that? Well surely you were at the hearing in 2003 at the West L.A Purdue office to secure funds to remediate Danson oil well? Oh not there either? Well how about the very first Venice Coastal Development Plan in 1989 at the paddle Tennis courts? You can of course get my drift. Posers step off. Heritage, tradition and pride cannot be bought or sold it is instilled and earned one broken bone at a time, one frontside air at a time. I have sent letters to the mayors office and to Counselman Rosendahl regarding the overnight security issue. I encourage everyone out there who cares about the skatepark to do the same thing. Thank you for reaching out to our office and know that we are working hand in hand with the VSA, our Recreation & Parks Department and our LAPD to clarify if formal agreements that would clarify roles and responsibilities can be created. The Councilmember passed your email to me and requested that I reply on his behalf. 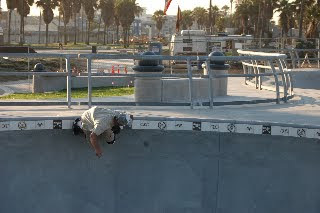 So with this in mind, know that the VSA is a true partner with the Councilmember to ensure that the Venice Beach Skate Plaza continues to be a safe place for all to visit. With local officials and the LAPD aware of the problem, hopefully a solution is not far off.